FREE shipping via USPS Priority Mail! 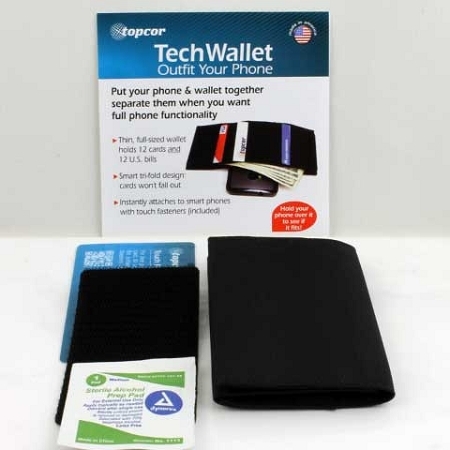 TECH WALLET:: Put your phone and wallet together. Separate them when you want. Keep full phone functionality. 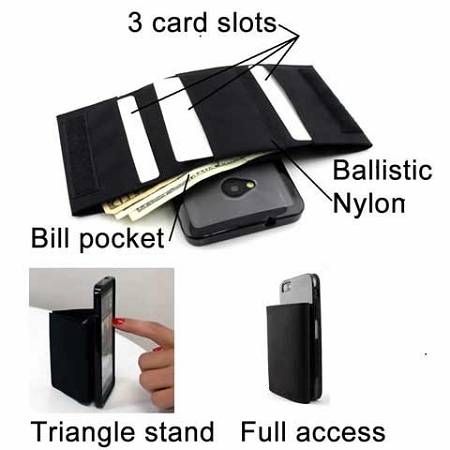 Thin, full sized phone wallet holds 12 cards and 12 bills. 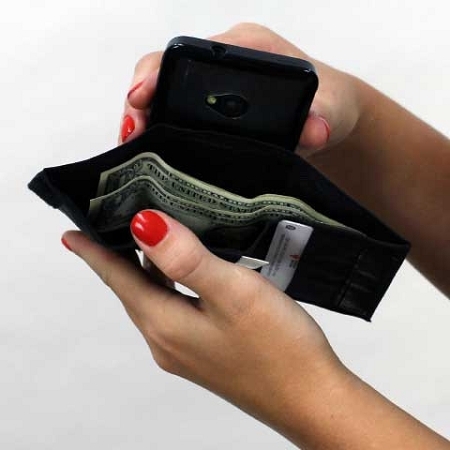 Smart tri–fold wallet design: cards can't fall out. Transforms into a triangle for use as a horizontal or vertical phone stand. 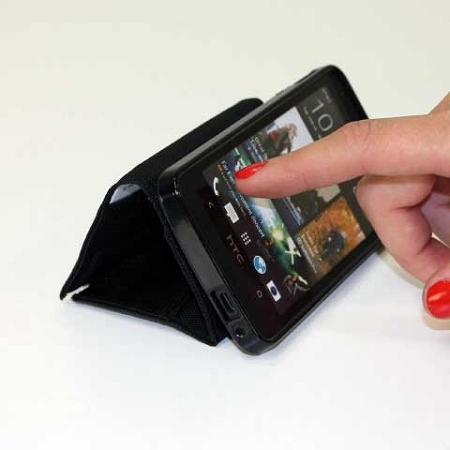 Topcor's wallet for phone fits, iPhone3, iPhone 4, iPhone 5, Samsung Galaxy S3, HTC One and most smartphones. 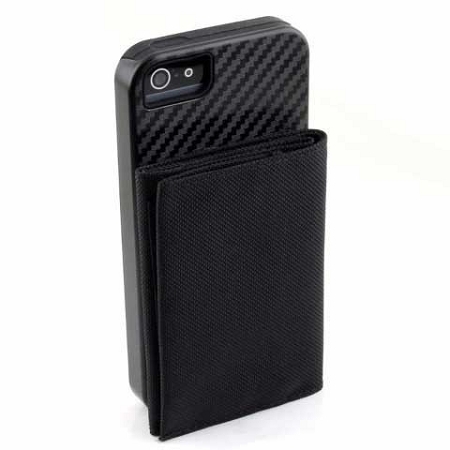 Instantly attaches to smart phones with touch fasteners (included). The Touch Fastener System is strong, thin and long lasting using advanced low profile hook and loop. It is compatible with all Topcor phone accessories. Hey Folks, This is Alex, president and founder of Strictly USA. We pride ourselves on trying/ using every single product that comes through our door. Last week, I received my tech wallet and haven't been without it since. It holds much more than I thought and is still very streamlined. In mine, I have 2 credit cards, id, 5 business cards, a wad of cash, rec center card and some other paperwork. Sadly, I don't miss my regular wallet,which is made in USA and I also love. Best part, when I leave the house, I grab the phone and the wallets along for the ride. It's so easy and convenient and very well made. A great gift for brother, dad or son. They'll love it too. Shop Strictly USA for high-quality, functional, attractive, and long-lasting products. All products are manufactured in the United States of America. Thanks for visiting! Let us know if there is anything we can do to help you browse our catalog or proceed with checkout by contacting us. Rest assured knowing your purchases are always secure at Strictly USA. ©2019 Strictly USA, all rights reserved. | Redesigned and developed for mobile by Jeremiah Shore.